Hours: Tuesday - Sunday 10 AM - 4 PM. Closed Monday. The Circus of Maxentius is the best preserved chariot racetrack of all Roman circuses, and is second only in size to the Circus Maximus. 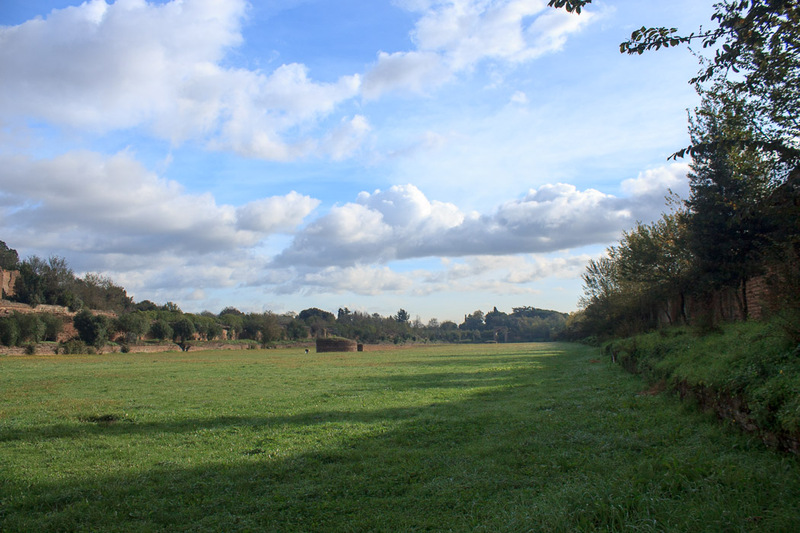 It is located between the second and third mile markers of the Appian Way, between the Tomb of Cecilia Metella and the Catacombs of San Sebastiano. 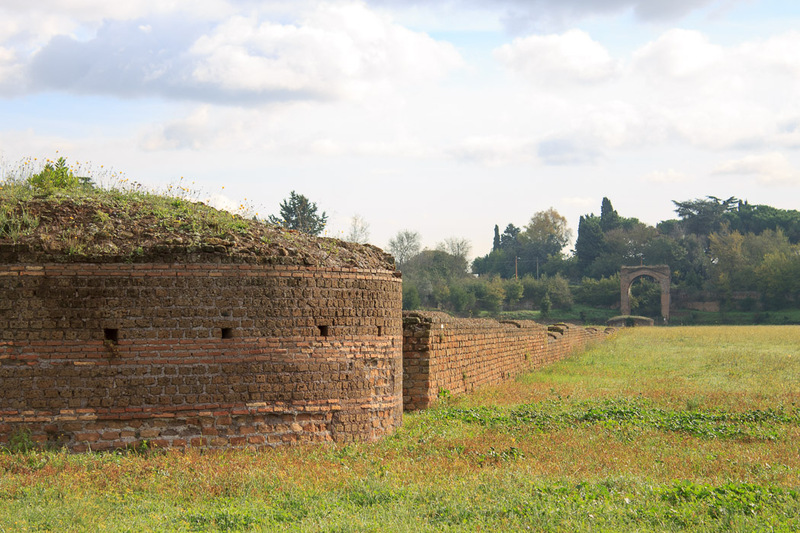 It is part of a complex of structures built by emperor Maxentius between 306 and 312 AD, which included a villa and a mausoleum as well as the circus. Until the 19th century it was known as the Circus of Caracalla, but track excavations at that time by Nivvy uncovered an inscription which dedicated the circus to the "divine Romulus", who was Maxentius' son Valerius Romulus, who died in 309 AD at a very young age. The inaugural games of this circus were funerary in character (probably for Romulus) and were the only games ever recorded at this circus. As a Tourist in Rome, you'll enter the circus on its west end where the remains of two gate towers which contained the mechanism for raising the starting gates to allow the chariots to race down the track still stand (photos below). 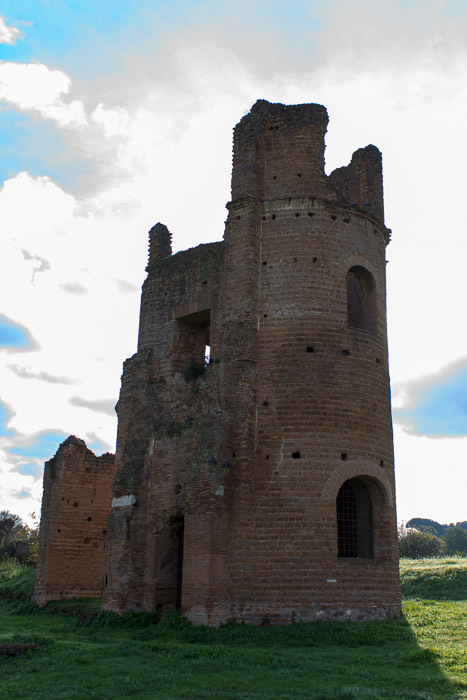 See all Circus of Maxentius photos. The track itself, today covered completely in grass which seems to be rarely mowed, extends off into the distance (1st photo below) for a length of 503 meters (a full half-kilometer!) where the bend is located which allowed the chariots to turn and come back toward the near end of the track. At that far east end of the track is a small triumphal arch (visible in the distance in the 2nd photo below). 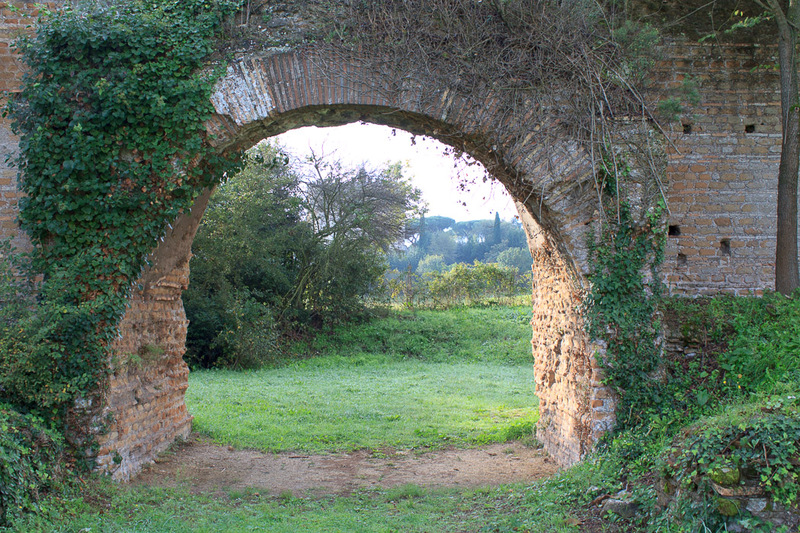 About half way down the track on the left (north) side is the imperial box (1st photo below), which is connected via a covered portico to the Villa of Maxentius, whose remains are well hidden today by foliage. Directly across the track on the south side is a small archway (2nd photo below) through which can be see the Tomb of Cecilia Metella (but I didn't take my photo from quite the right spot). That tomb is also entirely visible from the imperial box. It is theorized that the track was intentionally built at the proper angle for these alignments to the pre-existing tomb to occur. The judges' box was located about two-thirds of the way down the right (south) side of the track, where it would have been in clear sight of the finishing line, but I found no sign of this box in the ruins. The spina, the barrier running down the middle of the 90-meter-wide track, is exactly 1000 Roman feet (296 meters) long, and was clad in marble during the glory days of the circus. In the center stood the Agonal Obelisk, also known as the Obelisk of Domitian, which Maxentius presumably had moved from the Isaeum as part of the tribute to his son. Covered in hieroglyphs and lying broken in five pieces it was much discussed during the Renaissance and engraved by Etienne du Perac among others. The Collector Earl of Arundel paid a deposit for the pieces in the 1630s and attempted to have them removed to London but Urban VIII forbade its export and his successor Innocent X had it erected in the Piazza Navona by Bernini. The chariots that raced on this track were drawn by two, four, or sometimes even ten horses. The outer walls of the track itself were wider at the start to allow the racers to spread out before reaching the spina, and were also made wider at the turn at the far end to accomodate the turning radius of the chariots. As you can imagine, accidents sometimes happened and it wasn't uncommon that charioteers were wounded or killed during a race despite the fact that helmet and chest mail was required for the contestants. Think Ben-Hur. The spectator capacity of the circus was about 10,000 people, who stood on an elevated area surrounding the track which allowed them to watch the races in safety, but not much of this area remains today. 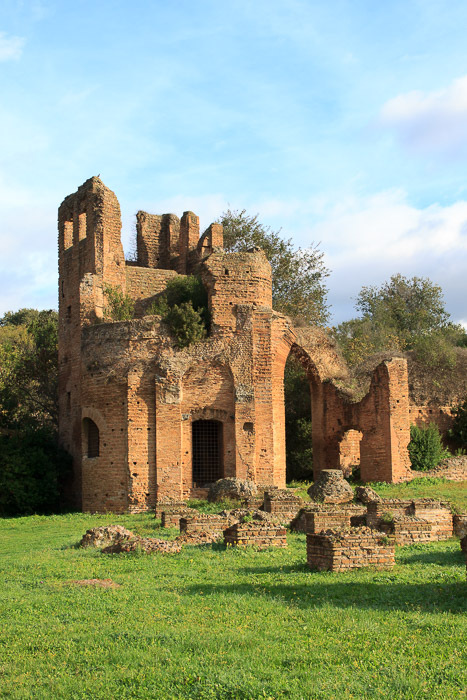 The circus and villa complex is best understood as an elaborate imperial version of the elite residences that appeared in Rome and the provinces in late antiquity, with large audience halls, familial tombs, and circus-shaped structures. 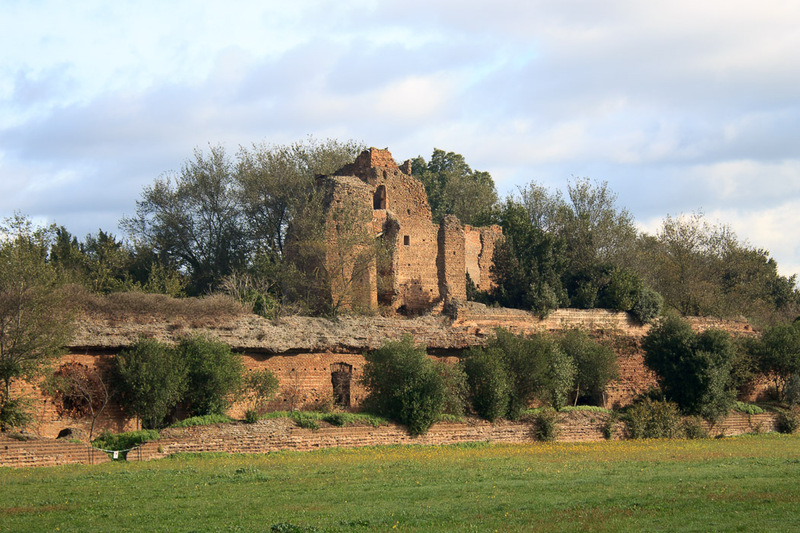 The original pattern for this type of complex can be found on the Palatine Hill, and a subsequent example in Rome is the Villa of the Gordiani. 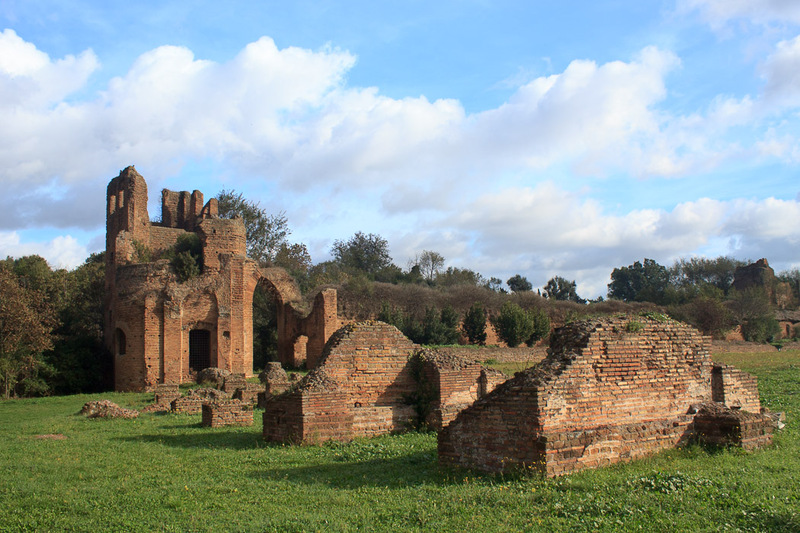 Although the towers are ruins, the spina largely covered and the arches well worn by time, the old circus is still an impressive site, and stands out as a great attraction to see along the Appian Way.